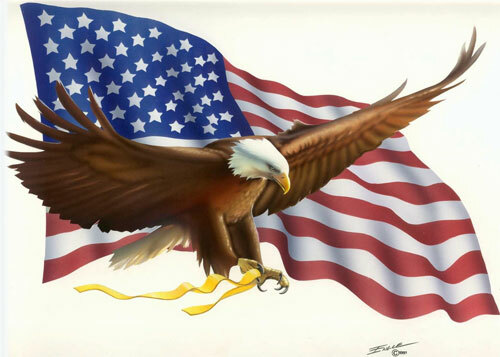 On July 4th the flag becomes the first national flag of the U.S. The Continental Congress resolves to have an official emblem on June 14th. There will be 13 alternate red and white stripes and 13 white stars in a field of blue, representing the 13 colonies. The first official Stars and Stripes, there is no official record to indicate its earlier use. Congress does not direct a specific arrangement of the 13 stars. The color scheme and design of the U.S. flag are symbolic of America itself. George Washington explained it this way: "We take the stars, blue union from heaven, the red from our mother country, separating it by white stripes, thus showing that we have separated from her, and the white stripes shall go down to posterity representing liberty." Congress adopts a new flag of 15 stars and 15 stripes to give representation to Vermont and Kentucky, the new states. The British attack Fort McHenry. The flag that flies over the fort inspires Francis Scott Key to write The Star-Spangled Banner. Authorized by Congress in 1795, the flag is still in use despite the fact that there are 18 states in the Union. With 19 states now in the Union, New York representative Peter Wendover wants to update the flag. He chairs a committee and forces debates in the House until the Flag Act is approved. There are 20 states in the Union. The Flag Act is approved by President James Monroe on April 4th. It restores the original design of 13 stripes and provides that each state will be represented by one star. President Monroe orders that the flag’s stars be arranged in 4 rows of 5 stars each, but his instructions will not always be followed. A 33-star flag represents the U.S. The first time the Stars and Stripes flew in a Flag Day celebration was at Hartford, Connecticut, the first summer of the Civil War. During the late 1800's, schools held Flag Day programs to assist the Americanization of immigrant children. The observance caught on in the communities, and numerous patriotic groups supported a national Flag Day. The 34-star flag becomes official July 4th, signifying the admission of Kansas into the Union. Two (2) more states (West Virginia and Nevada) will be added before the war's end bringing the total to 36 states. From 1867 to 1896, 9 more states are admitted into the Union and 9 more stars are added to the flag. William Canby, the grandson of Elizabeth Betsy Griscom Ross, makes a public speech in which he tellsthe story of his grandmother’s involvement in the design and construction of the new nation’s flag. He and other family members sign sworn affidavits saying that Ross often told them that she had made the first Stars and Stripes. While there are no records proving this, she was probably commissioned to sew the flag, and she also may have been responsible for changing the stars from being six-pointed to five-pointed, which were easier to make. On the flag’s 100th birthday (June 14th), the federal government requests that it be flown from all public buildings. The Stars and Stripes Forever is first performed on May 14th in Philadelphia, Pennsylvania. The flag that includes Oklahoma’s star becomes official on July 4th. New Mexico and Arizona are admitted into the Union--the flag is designed to include 48 stars. It will represent the nation for the longest period of time, 47 years. An executive order ofPresident William H. Taft on October 29th makes the first official provision for the arrangement of the stars: Hoist (height) of flag, 1 (unit). Fly (length) of flag, 1.9. Hoist of canton, or union (blue field), 7/13. Fly of canton, 0.76. Width of each stripe, 1/13. Diameter of each star, 0.0616. President Woodrow Wilson proclaims June 14th as the first Flag Day. But Congress doesn’t officially recognize it until Truman’s administration. President Herbert Hoover signs a bill designating The Star Spangled Banner as the national anthem, effective March 3rd. Congress adopts the Flag Code on June 22nd. Americans storm the Japanese island of Iwo Jima. Atop Mount Suribachi, Joe Rosenthal photographs 5 Marines and a Navy corpsman raising the Stars and Stripes. Rosenthal’s photo becomes the model for the Marine Corps Memorial in Washington, D.C.
President Truman officially recognizes June 14 as a national day of observance (August 3rd). The 49-star flag reflects the admission of Alaska into the Union. On August 21st, Hawaii becomes the 50th state and an executive order authorizes the new 50-star U.S. flag.President Dwight Eisenhower’s order sets the proportions of the flag and the design for the 13 stripes and 50 stars. The creator of the modern 50-star flag, Robert Heft, was a high school junior in Ohio when Alaska and Hawaii were being considered for statehood. As a history project, he got out a sewing machine and made a flag with 50 stars. A year later, in 1959 the states were admitted and a search was on for a new flag design. Heft's congressman helped him submit his prototype. 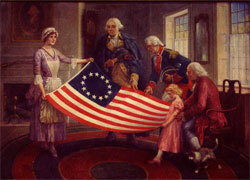 It was chosen over 109,000 designs, and his was the first flag with 50 stars to fly over Washington, D.C. The new flag becomes official on July 4th. Astronauts Neil Armstrong and Buzz Aldrin plant the flag on the moon. On June 20, 1985, Congress passed and President Reagan signed a law recognizing the "Annual National Pause for the Pledge of Allegiance" as part of National Flag Day activities. All Americans are urged to participate on June 14 at 7:00 p.m. (EDT) in reciting the Pledge of Allegiance. This simple ceremony is a gesture of patriotism at home and a sign of unity abroad. President Ronald Reagan signs into law a bill that makes The Stars and Stripes Forever the national march of the U.S. The Flag Protection Act is passed, making it illegal to mistreat the flag. The U.S. Supreme Court declares on June 11th that the Flag Protection Act is unconstitutional. When you are saluting the flag or saying the pledge of allegiance, stand up straight with your right hand over your heart. If you are watching a parade and a flag is carried past you, salute it the moment it passes. The flag should always be displayed and stored carefully so that it won't become torn or dirty. The flag should never touch anything beneath it, such as the ground, the floor, water, structures or objects. When a flag has become old and worn, it should be destroyed in a dignified way, preferably by burning it. When a flag is hung on a flagpole, it should only be displayed from sunrise to sunset, unless a light is shining on it. The flag should be displayed on all national holidays.